Your guide to choosing high-efficiency toilets that help save the Earth, gallon by gallon. Find the perfect toilets for your next project through Architizer’s new community marketplace for building-products. Manufacturers: Check out the latest construction leads and sign up now. One of the biggest ways a seemingly trivial toilet can contribute to the overall sustainable ecosystem of a building is by helping it save water. Designing for water conservation is an ever-evolving world that not only building-product manufacturers should be aware of, but also that architects should have a major responsibility in heeding. It’s no wonder, then, that water-saving toilets are among the most-searched-for items on Source, Architizer’s community marketplace for building-products. According to the United States Environmental Protection Agency, toilets are the main source of water usage in the home, accounting for nearly 30 percent of total indoor consumption. Multiply that number by the amount of toilets placed in a large commercial building or affordable housing complex — say, one that’s 10 stories high with 1,000 occupants — and the savings hit upward of 1.2 million gallons per year. So yes, something as specific as a toilet makes a massive difference in the reduction of water flow. That’s why specifying the right one can make or break a bathroom — not just aesthetically, but also in terms of the sustainable and economic impact on a building. Apart from cases in which public projects make proper use of touchless flush toilets, many architects are turning toward dual-flush systems that allow the user to determine the amount of water needed to circulate waste. We’ve all seen these toilets before: You sit there thinking there is a right and wrong decision to be made, but sometimes you’re in a rush, you choose incorrectly and the guilt that sweeps over you is very real. So it’s vital that we quickly get educated on dual-flush toilets, how they really benefit a building and, more importantly, the world. The dual-flush toilet was developed from the design of traditional flush toilets from Australia, where severe droughts and efforts to conserve the local water supply have been on the rise for decades. This “interactive” toilet design, while more expensive than typical low-flow options, incorporates a complex mechanism that allows individuals to manually select the water volume of each flush. This type of high-efficiency toilet employs a half flush for liquid waste, generally 0.8 to 0.9 gallons of water per flush (gpf), and a full flush for solid waste, around 1.6 gpf. The National Energy Policy Act, established in the ’90s, requires toilets sold in the United States to operate with no more than 1.6 gpf. (Prior to this, old toilet models used nearly 6 gallons of water or more per flush. Horrendous!) Any manufacturer offering a dual-flush system will achieve this minimum benchmark or do better. Manufacturers who design with the EPA’s WaterSense label will offer products capable of consuming 20 percent less than the current federal standards with 1.28 gpf. Imagine the impact of four full flushes from one toilet per day versus two half flushes and two full. The math is simple; that alone could save just under 2 gallons of water. And if a WaterSense product is chosen, the savings could be monumental. The EPA estimates homeowners could save 13,000 gallons per year alone. Dual-flush toilets usually come in two types. They’re often designed as wash-down toilets; some are wall-mounted with buttons above, and others are floor-mounted with a left-hand lever or integrated push-button atop the tank. Wash-down toilets, a European standard, are widely considered best for water saving, as they don’t use as much water pressure as siphon toilets. They employ larger trapways to easily push waste down the drain, which can lead to a 68-percent reduction in water usage compared to a conventional low-flow toilet. One potential drawback for dual-flush toilets is that they don’t retain as much water in the bowl at all times. This means streaking can more frequently occur, but clogging won’t. There are toilets out there, though, that address this issue. 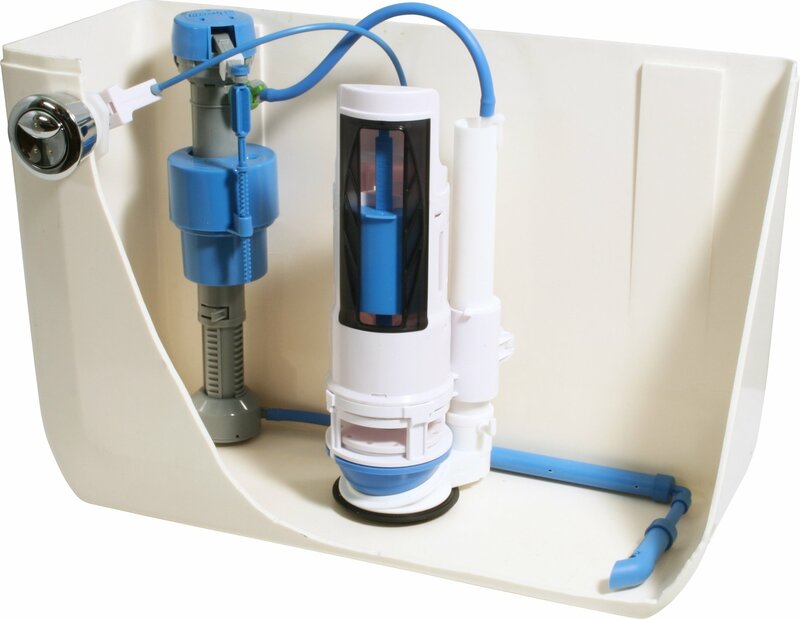 Some manufacturers offer siphon toilets with dual-flush capabilities. They’re usually floor-mounted, and, while bulkier than some small wash-down toilets, they push waste through in a much cleaner manner. Talking about toilets isn’t a particularly smooth subject, but it’s imperative that architects understand the implications of toilet specification. Water is a limited resource for a lot of people around the world. As aging water treatment infrastructure and the ever-prevalent threat of global warming continues, it’s the least we can do to choose high-efficiency toilets that help save the Earth, gallon by gallon. Search for the ideal toilets through Architizer’s new community marketplace for building-products. Click here to sign up now. Are you a storage manufacturer looking to connect with architects? Click here.